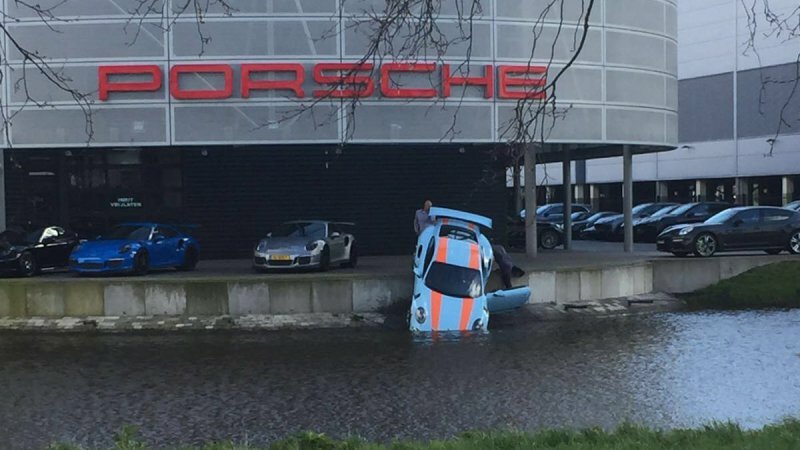 That's not what Porsche meant when they said 'Water Cooled'! Here we see the powerful GT3 RS taking drinks from the watering hole. Lesser Porsches, like the Panamera politely wait their turn, while the predator gets its fill. Someone took 'Gulf car' too seriously. Now that that's out of the way, we can move on. If you have better jokes, feel free to put them in the comments below. How would you caption this photo? The situation surrounding this isn't exactly clear, but either way, it's safe to say that someone did something wrong, and someone is going to be at least a little upset. At the very least, it would appear that no people were injured in the incident, and it is also lucky that the Porsche dug into the bank of the canal, as if the car had continued to roll, it would be completely flooded in the middle of the body of water. According to a report by an employee of the dealership, this was apparently a customer car that was visiting the dealer. The owner of the car has been reached, but has not yet seen the extent of the damage. It's fair to say that with the photo spreading like wildfire across the internet, he's seen photos of his car in the water, though. Rescue efforts have begun, and it looks like they are taking every possible measure to prevent further damage to the previously beautiful Porsche. We sure hope that this car will recover fully and will be back on track in no time flat. It deserves nothing less. For those concerned they were going to drag it out using the tow truck you see above, never fear. The dealership quickly realized pulling it back would cause terrible damage and the tow truck was just their to secure it. 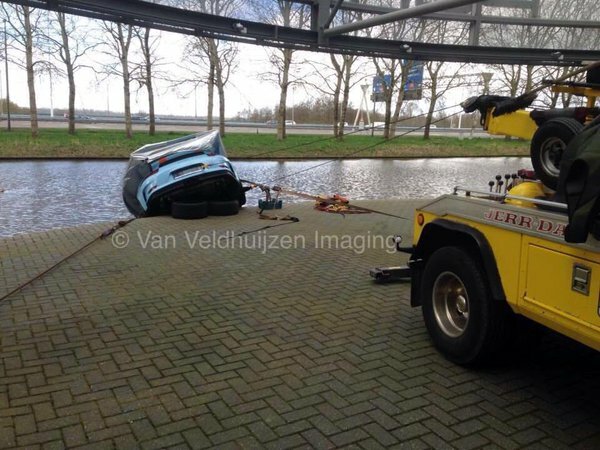 In the end, they called in a crane to lift the GT3 RS out. This Hologram Might Just Be The Coolest Porsche Ad Ever! Uh, the new owner really took a bath on the deal? Uh, that dealer seems awash in inventory? He really should have ordered the park assist. So the mechanic is lucky he didn’t take the car for a test drive. The drinks are on us. Bottoms up! OOPS. Thank God it wasn’t a 993..that would be tragic!